Boasts 16 Highway MPG and 11 City MPG! 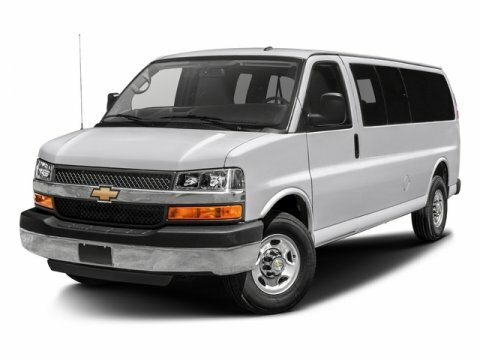 This Chevrolet Express Passenger delivers a Gas/Ethanol V8 6.0L/ engine powering this Automatic transmission. TRANSMISSION, 6-SPEED AUTOMATIC, HEAVY-DUTY, ELECTRONICALLY CONTROLLED with overdrive and tow/haul mode and internal transmission oil cooler Includes external engine oil cooler. (STD), SUMMIT WHITE, SIRIUSXM SATELLITE RADIO is standard on nearly all 2017 GM models. Enjoy a 3-month All Access trial subscription with over 150 channels including commercial-free music, plus sports, news and entertainment. Plus listening on the app and online is included, so you'll hear the best SiriusXM has to offer, anywhere life takes you. Welcome to the world of SiriusXM..*This Chevrolet Express Passenger Comes Equipped with These Options *SEATS, FRONT BUCKET WITH CUSTOM CLOTH TRIM head restraints and inboard armrests (STD), SEATING, 15-PASSENGER, (2-3-3-3-4 SEATING CONFIGURATION) 4-passenger seat is a 50/50 split, 2-piece configuration, REAR AXLE, 3.42 RATIO, PAINT, SOLID (STD), MIRRORS, OUTSIDE HEATED POWER-ADJUSTABLE, BLACK, MANUAL-FOLDING, MEDIUM PEWTER, CUSTOM CLOTH, LT PREFERRED EQUIPMENT GROUP includes Standard Equipment, ENGINE, VORTEC 6.0L V8 SFI FLEXFUEL (342 hp [255.0 kW] @ 5400 rpm, 373 lb-ft of torque [503.6 N-m] @ 4400 rpm) (Includes external engine oil cooler., AUDIO SYSTEM, AM/FM STEREO WITH CD/MP3 PLAYER, USB PORT seek-and-scan, digital clock, auto-tone control, Radio Data System (RDS), TheftLock, random select, auxiliary jack and 2 front door speakers, AUDIO SYSTEM FEATURE, USB PORT. * Stop By Today *Come in for a quick visit at Bleecker Buick GMC, 926 E 4Th Ave, Red Springs, NC 28377 to claim your Chevrolet Express Passenger!